« Does Donald Trump Think Washington Politicians Should Have More of Our Money to Help America Become Greece? Like Sisyphus pushing the rock up a hill, I keep trying to convince my leftist friends that growth is the best way to help the poor. I routinely share new evidence and provide real-world data in hopes that they will realize that good results are more important than good intentions. In a triumph of hope over experience, let’s see once again if we can get the boulder to the top of the hill. James Piereson of the Manhattan Institute has a superb article in Commentary about “The Redistribution Fallacy.” Here are some passages, starting with an observation that American voters are very skeptical about using government coercion to equalize incomes. Public-opinion polls over the years have consistently shown that voters overwhelmingly reject programs of redistribution in favor of policies designed to promote overall economic growth and job creation. …While voters are worried about inequality, they are far more skeptical of the capacity of governments to do anything about it without making matters worse for everyone. …Leaving aside the morality of redistribution, the progressive case is based upon a significant fallacy. It assumes that the U.S. government is actually capable of redistributing income from the wealthy to the poor. …Whatever one may think of inequality, redistributive fiscal policies are unlikely to do much to reduce it, a point that the voters seem instinctively to understand. Piereson points out that big changes in tax policy don’t have much impact, presumably because upper-income taxpayers take sensible and easy steps to protect themselves when they’re targeted by government, but they’re willing to earn and report a lot more income when they’re not being persecuted. …there are perfectly obvious reasons on both the tax and the spending side as to why redistribution does not succeed in the American system—and probably cannot be made to succeed. …The highest marginal income-tax rate oscillated up and down throughout the 1979–2011 period. It began in 1979 at 70 percent during the Carter presidency. It fell first to 50 and then to 28 percent in the Reagan and Bush years. It rose to 39.6 percent in the 1990s under the Clinton presidency, and went down again to 35 percent from 2003 to 2010. It is now back up to 39.6 percent. The highest rate on capital gains moved within a narrower band, beginning at 28 percent in 1979 and falling as low as 15 percent from 2005 to 2011. The highest rate is currently 23.8 percent. Over this period, regardless of the tax rates, the top 1 percent of the income distribution lost between 1 and 2 percent of the income share after taxes were levied. …At the other end, the poorest quintiles gained almost nothing (about 1 percent on average) in income shares due to cash and in-kind transfers from government. In 2011, for example, the poorest 20 percent of households received 5 percent of (pre-tax) national income, and 6 percent of the after-tax income. Moreover, it’s laughably inaccurate to claim that the United States doesn’t have a progressive tax system. Many in the redistribution camp attribute this pattern to a lack of progressivity in the U.S. income-tax system; a higher rate of taxation on the wealthy should solve it, they think. …A 2008 study published by the Organization for Economic Cooperation and Development found that the United States had the most progressive income-tax system among all 24 OECD countries measured in terms of the share of the tax burden paid by the wealthiest households. …The top 20 percent of earners paid 93 percent of the federal income taxes in 2010 even though they claimed 52 percent of before-tax income. Meanwhile, the bottom 40 percent paid zero net income taxes—zero. For all practical purposes, those in the highest brackets already bear the overwhelming burden of federal income tax, while those below the median income have been taken out of the income-tax system altogether. Indeed, it’s worth noting that the reason that government is much bigger in Europe is not because they tax the rich more, but rather because they have higher burdens on low- and moderate-income taxpayers (largely because of the value-added tax). Simply stated, there aren’t enough rich people to finance a giant welfare state, particularly when they can easily choose to avoid confiscatory tax levels. And this explains why honest American leftists occasionally will admit that they’re real goal is higher taxes on the middle class. That’s where the money is. But I’m digressing. Let’s get back to Piereson’s article. He also explains that redistribution doesn’t work on the spending side of the fiscal ledger. Turning to the spending side of fiscal policy, we encounter a murkier situation because of the sheer number and complexity of federal spending programs. The House of Representatives Budget Committee estimated in 2012 that the federal government spent nearly $800 billion on 92 separate anti-poverty programs that provided cash assistance, medical care, housing assistance, food stamps, and tax credits to the poor and near-poor. …most of the money goes not to poor or near-poor households but to providers of services. The late Daniel Patrick Moynihan once tartly described this as “feeding the horses to feed the sparrows.” This country pays exorbitant fees to middle-class and upper-middle-class providers to deliver services to the poor. …This is one reason that five of the seven wealthiest counties in the nation are on the outskirts of Washington D.C. and that the average income for the District of Columbia’s top 5 percent of households exceeds $500,000, the highest among major American cities. Gee, I’m shocked to learn that big government is a racket that lines the pockets of Washington insiders. The federal government is an effective engine for dispensing patronage, encouraging rent-seeking, and circulating money to important voting blocs and well-connected constituencies. It is not an effective engine for the redistribution of income. …those worried about inequality should abandon the failed cause of redistribution and turn their attention instead to broad-based economic growth as the only practical remedy for the sagging incomes of too many Americans. If you want an example of how statism hurts the less fortunate, look at what’s happened to Venezuela. It used to be one of the richest nations in Latin America, but bad policies in recent decades have resulted in stagnation and deprivation. Now, Venezuela is a basket case. It’s so bad that even establishment media outlets can’t help but notice, as illustrated by this passage from an article in The Economist. Though the poor initially benefited from “Bolivarian socialism”, economic mismanagement has made them poorer. In other words, Venezuela is a real-world example of the famous parables about socialism in the classroom and buying beer with class-warfare taxation. Demagogic politicians don’t understand (or don’t care) that when you punish production and reward sloth, you get less of the former and more of the latter. Which brings me back to Piereson’s concluding points. If you care about the poor, strive for more economic growth with policies based on free markets and small government. Nations that follow that approach vastly out-perform the countries that choose statism. That’s looking at the big picture. Now let’s look at an example that confirms Piereson’s point about redistribution programs mostly benefiting interest groups rather than poor people. John Graham of the Independent Institute has a very sobering column about Medicaid in the Providence Journal. It turns out that record amounts of spending for the program doesn’t yield much benefit for poor people. 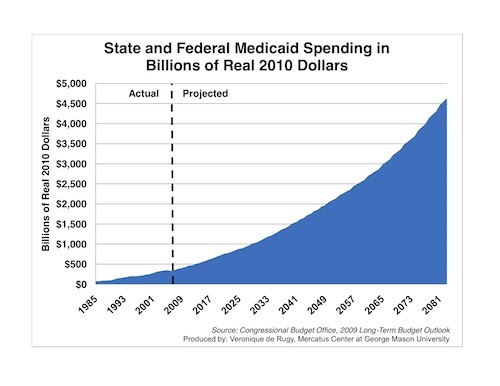 Medicaid is the largest means-tested welfare program in the United States. …new research suggests that only 20 to 40 cents of each Medicaid dollar improves recipients’ welfare. …How much does Medicaid increase recipients’ actual welfare? In other words: Does $100 of Medicaid spending increase the dependent’s well-being by $100? More? Less? …recipients’ behavior indicates they only valued their benefits at one-fifth to two-fifths of the money spent is a serious indictment of the program. So who does benefit from the program’s ever-growing fiscal burden? But here’s the most amazing conclusion from this new research. Medicaid enrollment did not improve mortality or any physical health measure. The only logical conclusion is that we need to reform Medicaid. Heck, let’s fix the entire mess created by the Washington-created welfare state. It’s been bad for taxpayers and bad for poor people. P.S. If you want to see sloppy and biased analysis (paid for with your tax dollars), take a look at efforts to rationalize that redistribution is good for growth from the International Monetary Fund and Organization for Economic Cooperation and Development. Redistribution per se is not bad. This discussion revolves around excessive redistribution and redistribution through the filter of government bureaucracies. In discussing the FairTax, few object to a relatively small “prebate” paid directly to families. This payment definitely qualifies as redistribution. On the other hand, the Swiss proposal of a basic income of $2,800 a month is ridiculous. We can let states and charities deal with individual exceptions, including support for illegal immigrants if they so desire. Direct payment would bypass bureaucracies and political manipulation. Current safety-net programs would either be eliminated or reduced by the monthly amount, including: welfare, unemployment and disability benefits, ACA payments, Medicaid, Social Security, and Medicare. Dan’s article lists historic marginal rates, however, it is the poor and the disabled that potentially pay far higher marginal rates, when they hit a benefit cliff and lose food stamps, healthcare, and housing. Cash payments unaffected by income levels would eliminate the disincentives to earn income. This would also make a flat tax progressive and a political winner. did I mention isis sleeper cells generously salted in the mix? Tax rates are generally lower in America, compared to the the near zero growth welfare countries of Europe. The difference is that in America you need to rise to about 7x average income to be subjected to the top tax rate. In the welfare states of Europe, at an income of 2-3x average you are pushed into the top tax rates. In addition, in Europe, a ubiquitous and inescapable flat consumption tax, VAT, levies an additional 20-25% tax across the board. Effort-reward curves are flatter, growth a quarter of world average. A deterministic trendline to decline. But taxes on the rich are a rhetorical prerequisite for more taxes on everyone. While many people assign deviant motives to the left, a supposedly systemic strategic leftist plan to raise taxes on the rich, so that taxes can subsequently be raised across the board, I do not subscribe to this systemic conspiratory theory. Taxes will rise for the rich as a preamble to rising them for everybody, not because there is a leftist plan, but because this is the only way that taxes CAN be raised to have a larger percentage of people’s labor be harvested by the government. It happens organically because this is the only way that it CAN happen. And increased government harvest is inevitable since untouchable welfare benefits are on autopilot to consume an ever larger proportion of GDP. Voters, not only have little desire to reform these programs in any substantial way; voters have not even stopped voting themselves new permanent and irreversible welfare programs. Take for example ObamaCare, which is poised to quickly become the third pillar of America’s Europeanization, 50% GDP state, quarter of average world growth nation. I.e. a deterministic path to decline. Talk is just talk. Not only are all the existing programs remaining, but a plethora of new programs are waiting at the gate for their brief moment of majoritarian approval. Then, once they’re in, they’re in. Permanent and irreversible. Yes, generally Americans are weary of redistribution over growth schemes. But every few years or so they let in yet another irreversible welfare program while unwilling to take any of the old ones out of circulation, consuming an ever larger percentage of GDP and flattening the effort-reward curve well below the levels necessary to keep growing at 4% annually and thus retain top prosperity ranking in the world. The road to 50%-60% socialism (the percent of GDP consumed by the collective/government in a welfare democracy) has already been baked into the American pie. The below par motivation and welfare state level of economic growth, certain. How do you think it happened in Europe folks? How did Europe get locked into a permanent and irreversible quarter average world growth trendline to decline? It’s the magic potion of collectivism. The voter-lemming will buy. Yes, he’s reluctant to buy, but once in a while he does buy; and what he has already bought he keeps. It’s a one way valve. Only few electorates escape. Serendipitously, if anything, by application of the general law of probabilities. Stay mobile and you will have a chance to escape. Doing nothing does not give you an entitlement to survival. People who have lived in Europe have seen how this works. In an ironic fate, many of them emigrated to America to contribute to America’s socialist push, and will promptly emigrate again, once America becomes the quarter world growth rate trendline continent, just like the continent they originally left behind (many of them emigrating for that very low-growth reason, though few of the social democracy minded put two and two together). The rest of you dedicated Americans will then stay behind to simmer in socialism. Supporting the mediocre welfare programs of what will have by then become a middle-income country. C’est la vie. The voter-lemming will buy.